I have with me today the AWESOME Alex Tully, whose second novel, Beautiful Chaos, which released June 2016! 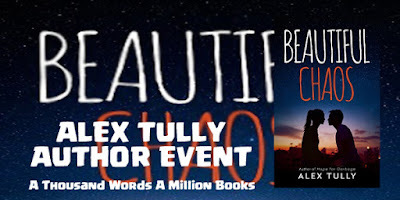 Alex is hear, answering my interview questions and is also giving away a signed paperback of his latest novel! YAY! Thanks so much for being here, Alex, it means so much to me! Wow, I really had to think about this one, but here goes…when I was in college (early 90’s), my boyfriend (my high school sweetheart) surprised me one night by coming to visit me from out of town. We ended up getting in a fight because I had a huge final to study for & he wanted to hang out/go out, whatever. So he left and went to visit two other girls we went to high school with who happened to live in a dorm room downstairs. Of course I wanted to know what was going on down there, so my roommate & I (we are still very good friends) decided to spy outside their window. They were on the ground floor but their window was high—above our heads. We got milk crates (those were popular in dorm rooms back then) and stood on them trying to eavesdrop. Well we heard some arguing—apparently my boyfriend had snuck a bottle of beer in with him. So one of the high school friends decided to pour it out the window, which in turn splashed all over my roommate and I! We never made a sound but had to run back to our room trying to avoid a resident assistant because we stunk like beer. My boyfriend and I did make up – & we’ll be married 20 years next June J.
Ireland— In both of my novels there are some references to my Irish heritage with mostly the names I’ve chosen: McNulty, O’Connell, McGuire’s Pub. When I was growing up, an Irish flag always flew under the American flag on a pole in our front yard and we always skipped school on St.Patrick’s Day. Great Barrier Reef in Australia— I’ve only been snorkeling a few times but loved it and I could only imagine the beauty of what lies under those waters. Serengeti in Africa— I would love to take a safari during migration to see all of the wonderful wild animal in their natural habitat. Well, when I began writing Hope for Garbage my kids were eight and ten—they are now fourteen (my daughter) and sixteen (my son). One thing I’ve heard repeatedly through the years is, “Mom, you should write something like the Hunger Games, or like The Maze Runner, or like Divergent…” I would tell them, “I write about real life, it’s all I know how to do and it’s all I want to do.” But of course they never gave up. So if I could collaborate with an author it would probably be Suzanne Collins so she could help me with a dystopian novel! 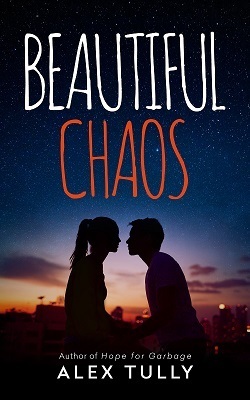 By the way, my kid’s tastes are finally changing and my daughter eagerly read Beautiful Chaos although she thought it was “totally awkward” that I actually wrote it—lol. She also told me very specifically how the cover should look and I think she did a great job. Why should you read my novel? Beautiful Chaos is different—very different. I’ve read a lot of YA romance, and I can say with 99.9999% certainty, you will not read a story like this one. It’s not because I try to come up an idea that’s never been done—it’s because when I write, one thing leads to another, and things get a little crazy. But this is also a true love story told from Vivienne’s point of view AND from Brady’s point of view. You will feel like you really know these characters and you will feel like you are right there with them as they go through all of the chaos together. I’m really excited about how it turned out and from the feedback I’ve gotten so far, I think readers are excited as well. What advice would I give to my characters? I’m forty-four years old and I want my own kids to know that when bad things happen in life—things that don’t seem to make any sense—you can’t get pulled down into it. You’ve truly got to say ‘it is what it is’ and move on. To Vivienne: I would tell her if something is really bothering you, don’t feel hopeless about it. Try to do just one thing—anything—that will make it better. I think all of us, at one time or another, feel overwhelmed by the bad things that happen in the world and think, “What can I really do to help?” Well, it doesn’t take a lot. Hello! 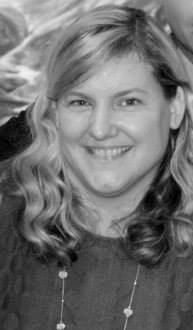 A little bit about me… I live outside Cleveland, Ohio, USA with my husband, two teenagers & a dog named Trooper. I hold an MBA & worked in finance for several years until my kids were born. Shortly thereafter I was diagnosed with multiple sclerosis and decided to simplify my life. I quit my job, we bought a smaller house, and I decided to pursue something I had always been passionate about—writing. It’s funny how life works that way. When I’m not writing I am doing mom stuff, and if it’s a really good day I get to read (actually I Audible) or Netflix binge J I am currently working on my third novel, hoping to have it published by next summer. Blurb Description: While most seventeen year-olds work part-time delivering pizzas or whipping up frappuccinos, Brady O’Connell’s job is a little less conventional. Helping his dad with the family ‘business’ is a responsibility he doesn’t take lightly, especially when thousands of dollars are being exchanged. There are rules to be followed, timetables to be kept. But when his best friend Jay gets backstage concert tickets, and business interferes with a once-in-a-lifetime opportunity to meet their favorite band, Brady decides to break the rules, just one time.